'Jordan threw a party next to Dan Quayle. She then began to have s*x with an enormous whale. The band was pumpin’ and dumpin’ on my mate called Wing. You should have heard those funky chaps, ding – his – ling – LET’S C*CK!’. Well, I am sure that it goes something like that, huh? However, maybe these chaps know better than me – Director: Richard Thorpe; and Actors: Elvis Presley, Judy Tyler, and Mickey Shaughnessy – especially in 1957 and for 96-minutes. Now I am sure that when emotionless hooligan, Vince Everett (Elvis Presley), is sent to prison for a crime of valour, he did not expect to then get so much help. Well, you see, once inside, he befriends a fellow felon, Hunk Houghton (Mickey Shaughnessy), whom teaches him to play the guitar and sing. Moreover, six months later, when Vince is eventually released from his incarceration, he gets yet more help too. This time though, it is not by a fellow felon, oh no, instead it is by a music scout named Peggy Van Alden (Judy Tyler) . Now, because of Vince’s talent, Peggy gets him some time in a record studio, she aides him in honing his craft, and on top of that, she gets for him a record contract to boot. However, the contract that Peggy gets for Vince does not pan out to well for him. Therefore, there an then, Vince decides that he will take matters into his own hands, and he – along with Peggy – forms a record label of their own, and together they start a fresh in this crazy musical business. But do you think that this work out well for Vince this time round? Err – kind of. Because on the one hand, he gets recognition, he gets a spot on a television show, whilst landing himself a movie contract as well. Whilst on the other hand, his relationship with Peggy deteriorates, he gets confused between love and lust on a movie set, plus in addition to this, his old reformed prison pal, Hunk, pays him a visit, and calls in an old favour that he owes him. Worst still, as time ticks on, Vince becomes detached and aloof with those who are around him, thus causing friction between himself and whoever is in his sight. And that is why what next transpires, is a rather rhythmical affair indeed – as propositions are made – tempers are frayed – voices are waylaid – and songs are finally played. 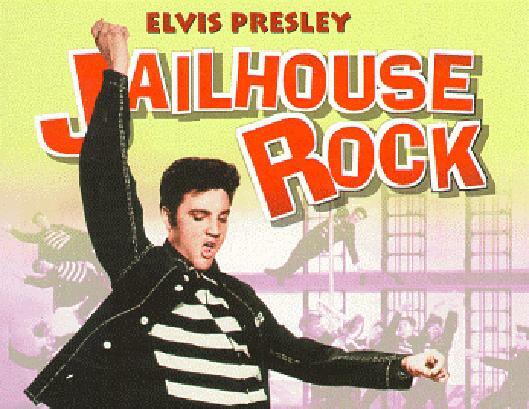 Now I have a problem with ‘Jail House Rock’ that has nothing to do with the concept of this movie – as I find it kind of pithy, and it reminds me of a bio-pic of sorts. Moreover, it has nothing to do with the acting either – no, that is fine too, even if pronounced in places. You see, my problem with this film, is all to do with the first half of this piece – mainly because of the fundamental principle of dissociative association. 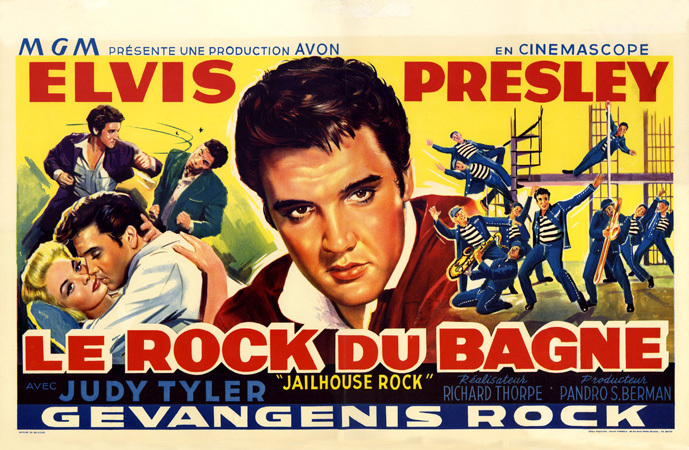 When the movie starts, Elvis’ character is sent to prison for killing a man in a fistfight. Granted, it is plainly shown that he did not mean to do this, but still, what do you think that he does once inside? Show remorse? No – he learns how to play the guitar and sing instead. Well – I mean – does that sound logical to you? I would have thought that there would have been some sort of redemptive signs shown – but no – music baby, music all the way. The character played by Judy Tyler when she is first introduced, Peggy, is not really shown in the best light. Because she tries her best to help Elvis’ character, by paying for record time, packing in her job, and even investing money in his talent. And what does he do for her in return? He shows her up at her parents place, he expects her to fall for his manly embrace, and, on occasion, he is quite rude to her too. OK, I am sure that this is probably something to do with sort of fifties macho ‘man thing’ – but today – ooffff, too ‘of it’s time’ for my liking. Fair enough, as I said before, my gripe with this 'Love Me Tender' is purely a dissociative one where the beginning of the film is concerned. As for the rest of it is on the other hand – well – I kind of liked it. For a start, I liked the music – well, who cannot. Next, I did like how ‘Jail House Rock’ seemed biographical on a certain level, as if it told someone’s life story – God know whose life story though. After that, I did really enjoy the ending of the film, as it came out of nowhere, and knocked me for a six – so to speak. And finally, I was surprised by Elvis’ performance, because it did have a James Dean like quality about it – which is a good thing in my book.